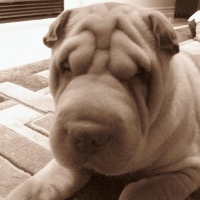 The color of a Shar-Pei is determined by a combination of coat color and skin color. Sun exposure can lighten or bleach the coat color, but there are sun screens available for dogs to protect the color of their coat. People sunscreen is poisonous to dogs. I normally just limit their sun exposure after they lose their puppy coat. They all shed differently. Usually the puppy coat and is the heaviest shed. Sometimes I will shave them when they really start to lose coat. It grows back very quickly.